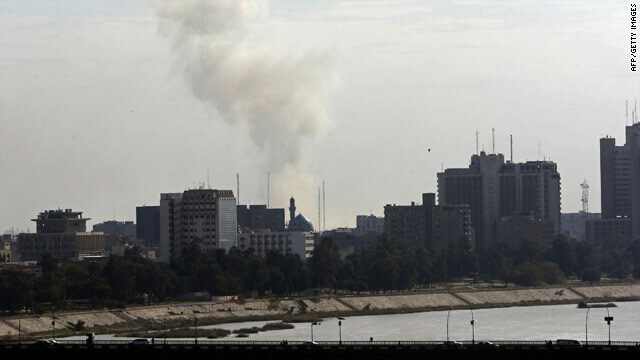 Smoke billows from the site of a car bomb attack on a government forensics office in Baghdad on Tuesday. Baghdad, Iraq (CNN) -- Islamic State of Iraq -- an umbrella group which includes al Qaeda in Iraq -- said it had carried out a string of vehicle bomb attacks that killed at least 36 people in Baghdad Monday. The radical group made its claim Wednesday on a Web site where it often posts statements. The same group claimed responsibility for coordinated bombings in August, October and December of last year, attacks which killed and wounded hundreds of Iraqis. The statement ridiculed the defense of Baghdad's heavily guarded International Zone, and those who thought they were safe there "because of the intensive security measures and the tens of checkpoints, surveillance equipment, and concrete barriers that they put around these sites." The attack "is a response to the lies of the silly people in the Green Zone" -- as the International Zone is often known -- "and all the fabricated slim heroic stories of their security forces," the statement said, warning of "stronger and dreadful" attacks to come. On Tuesday, the top U.S. commander in Iraq, Gen. Ray Odierno, told reporters he believed the hotel bombings were carried out by al Qaeda in Iraq. He said they are now using new tactics, never seen before here -- in two of the hotel bombings, gunmen in a second vehicle opened fire at the hotel checkpoints, allowing the suicide bomber to drive in. Odierno said they have had intelligence for about a month now that the group intended to carry out bombings under the cover of small arms fire. Also Tuesday, 18 people were killed and 80 were wounded in another attack when a car bomb exploded in central Baghdad, authorities said. The explosion occurred near a government forensic office and damaged the building, Iraq's Ministry of Information said. The blast was caused by a suicide bomber who drove through a checkpoint toward the forensic office, the ministry said. The latest bombings raise concerns about the ability of Iraqi forces to maintain security as the country prepares for crucial national elections on March 7. The buildup to that vote has been dominated by controversy over the legitimacy of hundreds of candidates banned from participating because of alleged links to former dictator Saddam Hussein's regime. The 511-name "blacklist" issued by Iraq's Accountability and Justice Commission, which is charged with purging former members of Hussein's Baath Party from public life, includes many prominent Sunni Arab politicians. Banning such candidates has raised fears of alienating the Sunnis -- an issue during the 2005 elections that analysts say was a contributing factor to the years of sectarian violence that followed. Monday's bombings also followed the execution earlier in the day of Hussein's cousin and notorious henchman Ali Hassan al-Majeed -- also known as "Chemical Ali." Odierno told reporters Tuesday that U.S. investigators were working with Iraqi security forces to determine who caused the blasts. The explosions seemed to be related to the upcoming election, Odierno said. "They are trying to create the most damage they can so people question the government," the general said. "They don't want to see the elections move forward. They want to see people lose interest in the elections. They don't want people to participate." The U.S. Embassy in Baghdad condemned the attacks on the hotels. "The terrorists who committed these senseless crimes aim to sow fear among the Iraqi people. We are confident, however, that the Iraqi people will stand fast and work together to build their common future in peace and security," a statement said. CNN's Yousif Bassil contributed to this report.